UCF Knights head coach George O'Leary is stepping down from the athletic director job. 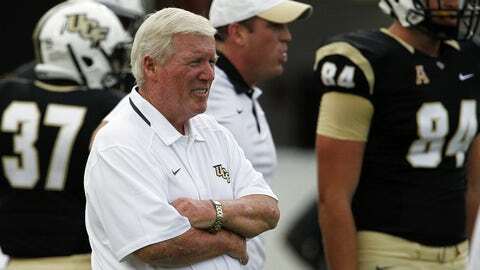 ORLANDO, Fla. (AP) — University of Central Florida football coach George O’Leary is relinquishing his job as the school’s interim athletic director. O’Leary said Monday he is stepping down from the athletic director job immediately. He will remain UCF’s football coach. Chief financial officer Brad Stricklin will take over the AD job. He was hired at UCF in 2006. O’Leary took over the athletic director job last June after Todd Stansbury accepted a position with Oregon State. The football team has struggled this season with a 0-6 record. The Knights lost to UConn last Saturday 40-13.